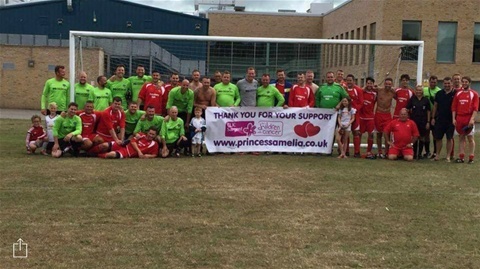 The wonderful Red Arrow FC arranged a charity football match for CLIC Sargent on 28th August 2016. This was billed as Red Arrow FC v Red Arrow legends. After 90 minutes it was a thrilling 0-0! The game went to penalties where Ramsgate's number 1 keeper performed a string of fine saves (although the arm over save always looks good for the camera). Graham Birkett missed from 12 yards out although not to be unexpected! The legend back line of Richard Todd Ian Purdy Terry Green and Rob Mangan looked solid and it had an air of the old Arsenal back line from the 80's! However when Greg Parsons came on the obligatory penalty was coming! Kyle Holden looked ok at times although he can't blame his hair in his eyes (slick). The little terrier of Elliot Austin was always going to cause trouble and with a fine touch and a "Barkley" esq pass into Michael Belsey who fired over the bar from 3cm out, this should have won it for the legends. However it wasn't to be and to penalties it went. All players had to take a penalty and after the 7th or 8th penalty it was clear to see that most people wanted to get down the pub! Thanks to all players and supporters and all at the Red Arrow Club and St Lawrence Tavern. Thank you to Miss Jo Park for officiating the game.